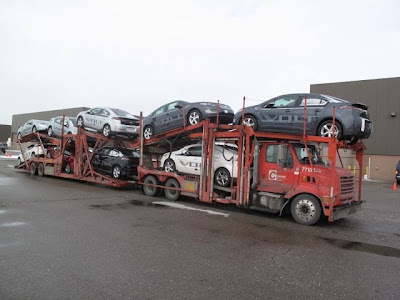 The Chevrolet Volt demonstration units are a popular showroom draw for dealers as they let consumers look, touch and drive the electric car with extended-range capabilities. It’s part of the plan to gain exposure for the vehicle and the Chevrolet brand. Almost nine of 10 customers who traded in a vehicle as part of their purchase are new to the Chevrolet brand. That’s why hundreds of Volts that could be sold to individuals are tagged for dealers as demo vehicles, meant for customer exposure to the Volt and to other Chevy products they might otherwise not see. Chevy expects to deliver Volts in all 50 states by the end of 2011. Deliveries begin in Virginia, Maryland, Delaware, Pennsylvania, North Carolina, South Carolina, Georgia, Florida, Oregon, Washington and Hawaii in the third quarter. “We know the best way to experience the Volt is to get behind the wheel and drive it,” said Cristi Landy, Chevrolet marketing director. “An added bonus is that our dealers are seeing that the Volt is increasing traffic onto our dealer showroom floors and is exposing consumers to Chevys line of ‘gas-friendly’ vehicles, including the Cruze, Malibu and Equinox. The Volt’s extended-range capability offers a total driving range of up to 379 miles, based on EPA estimates. For the first 35 miles, the Volt can drive gas- and tailpipe-emissions-free using a full charge of electricity stored in its 16-kWh lithium-ion battery. When the Volt’s battery runs low, a gas-powered engine/generator seamlessly operates to extend the driving range another 344 miles on a full tank.